Food Costs > How Much Does Baklava Cost? How Much Does Baklava Cost? Baklava is a type of dessert made with Phyllo dough, butter, nuts, and sugar. Each layer of baklava is sweetened with a syrup that is absorbed through its layers, and it appears to be golden brown after baking. Historically, this dessert is only prepared by wealthy families during special occasions; however, anybody who wants to eat it will be able to bake some at an affordable price. On average, if you were to purchase it online, the price per package will be anywhere from $20 to $50 depending on how many pieces are in the package and the company/baker creating it. For instance, this 28 to 30 piece baklava retails for $18 to $20, plus $7 to ship. Plan on budgeting about $1 per piece. At a local bakery, some sell baklava for $1 to $2.50 per piece. This can depend on the bakery’s reputation and geographical location. 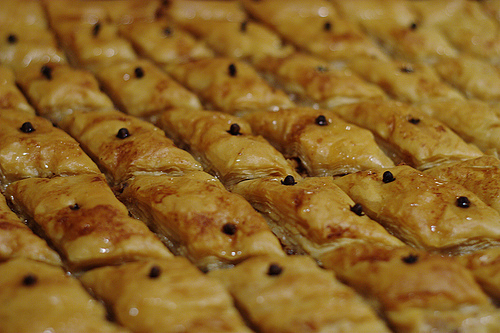 Baklava can be found in many Greek and Middle Eastern restaurants and bakeries. The basic ingredients will include phyllo bread, which is a flat bread, nuts, syrup and/or honey. Pay close attention to the nuts and syrup ingredients being used as this can tell you the origination of the recipe. Syrup with cardamom is said to come from Arab countries, while syrup with cloves and/or cinnamon are said to come from the Balkan peninsula. The average shelf life is 14 days; however, it can be refrigerated up to 45 days. If frozen, it can retain its freshness for up to 120 days. For a generic baklava, one two-by-one piece will have 330 calories, 23 grams of fat, 36 mg of cholesterol, 290 mg of sodium, 29 grams of carbs, 10 grams of sugar, five grams of protein and 2 grams of dietary fiber. Baklava is made from a Phyllo dough, nuts, butter and sugar. Once baked, a sweet syrup is poured on top, allowing it to soak into its layers. It’s a Mediterranean dessert known to go as far back as the 8th century B.C. because, during this time, Assyrians were known to bake thin layers of dough with nuts and poured honey over it. It was only made on occasion since, at the time, only the rich could afford this dish. Purchasing online can often incur additional shipping costs. Phyllo dough, a dough that is used to make Baklava, can be found at many local grocery stores. Generally, you will want to check the refrigerated section of your grocery store to find it. Keep in mind that it can dry out rather fast if you don’t refrigerate it fast enough. Try adding nuts, such as almonds, walnuts, and pistachios, to add more flavor. Common spices found in this dish includes cinnamon, cloves and even cardamom. thebaklavaguy.com notes the Americanized version is often sweeter than in other parts of the world. If purchasing online, it’s best to see what other purchasers said. While some sellers may have a lot of good reviews, pay attention to the bad as well to see what they are saying. Baking your own baklava at home isn’t hard at all. Most recipes call for a few ingredients, and when baking is included, it should take no longer than three hours to finish. I paid 1.50 per piece at my local bakery.